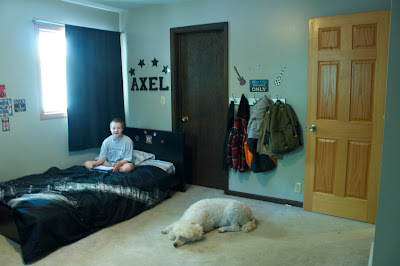 Then we brought Abel home and had to do some rearranging, plus adding a bed. The boys loved their room, but I was never quite satisfied with it. I started having nightmares about the fact the beds were in front of the window and not being able to get them out during a fire. For two months I fretted about this room. In the meantime, Angela had decided to take over the spare bedroom upstairs. She has been downstairs in the pirate room since she was 11, but was now feeling left out of the party upstairs. She wanted to move back up! I had an idea how to make all of this work, but Dean was not happy with my suggestion. Not only did it mean him giving up space, but it meant a lot of work rearranging and purging. We procrastinated. I talked about it on Facebook but could just not get up the ambition to start the project. There was no way to avoid the fact that moving bedrooms around meant many things had to be done simultaneously. How do you clean out four closets, paint three rooms and move three rooms worth of furniture simultaneously? We didn't know where to start! Then I realized the first day of school was coming fast and I needed to get this project done before that! I started in one closet in the master bedroom and...I swear....the house exploded at that point! We had stuff e.v.e.r.y.w.h.e.r.e! I lost count of how many loads went to Goodwill (it felt so good to purge!) or how many garbage cans were filled up. And now it is done! I'm really happy with how everything turned out, and I am loving all our new spaces! The boys have the same decorations, just in a different, much bigger room. I explained to Dean there was no rule that says the parents must sleep in the biggest bedroom. We don't use the closets in our room for clothes (we have a family closet in the basement by the washer/dryer) so our closets tend to just collect junk. But the boys could use those two small closets for the wide variety of toys we they have. Toys for kids from toddlerhood up through 6-7 years old. Here is their new space. The boys love the starts on the wall, and when the light is right they reflect all over the room! The dogs like there is room to lay in there while the boys play. 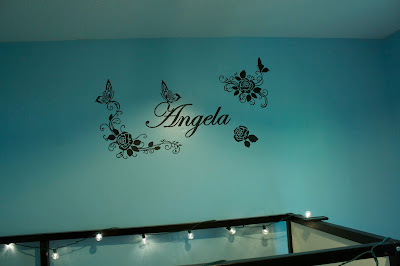 Angela absolutely LOVES her new room. 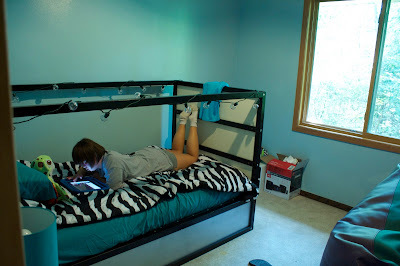 She spends a lot of her day hanging out in there, going through year books and laying on the somatron while she plays on the iPad. I'm not sure which part she loves the most: the mirror butterflies all over the walls or the lights on her bed. 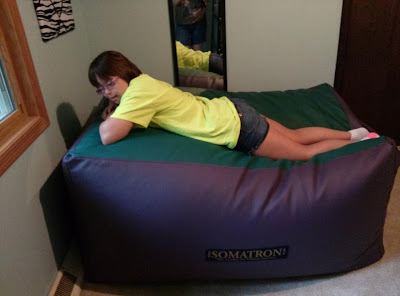 The somatron takes up a lot of space in her room, but is only temporary until our basement flooring is in, then it will move down there to the sensory room. The blue in the other pictures is a bit washed out. This picture is closer to the true color. How come we haven't seen a gazillion pictures about your family closet? OK, you know I'm kidding. 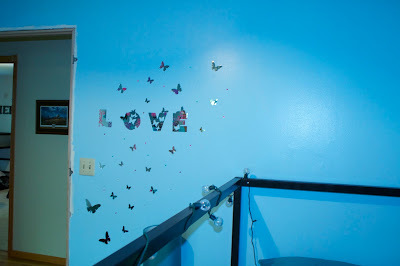 I love the boys' room! 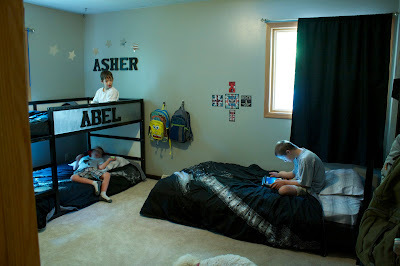 We are considering getting the same beds for a rearranging, when Harel will share with Ezra and Shiri moves in with the middle girls. Oh, loving the rooms!!! I need to investigate this Somatron . . .
Hevel, if ever a day comes when my laundry is 100% caught up, I will take a picture! HA! Hope Anne, I meant to post a link to the somatron. I'll do a post about it with the link. Stephanie, did you notice Angela is in the same bed? It's just flipped over. Wow, well done!!! And I suppose you're right - who says the parents have to be in the biggest room? Especially when one of those rooms needs to hold 3 boys. Great idea, and I'm so glad you got it done before school started! Love the rooms. Impressed with the purge. But ... the main thing that struck me was that Angela likes to hang out and look at yearbooks. Shawen wants to take them everywhere! He loves his yearbooks.